Research background: Recently there has been an increase in interest in the studies of income inequalities. The findings of numerous empirical studies show that males earn higher wages than females. A variety of techniques of income inequalities decomposition are becoming popular. New procedures go far beyond the Oaxaca-Blinder decomposition. They allow to study differences of income distributions for various groups of people and to decompose them at various quantile points. Purpose of the article: The aim of the paper is to compare personal income distributions in selected countries of the European Union, taking into account gender differences. Methods: First, we examined the income inequalities between men and women in each country using the Oaxaca-Blinder decomposition procedure. The unexplained part of the gender pay gap gave us information about the wage discrimination. Second, we extended the decomposition procedure to different quantile points along the whole income distribution. To describe differences between the incomes of men and women, we constructed the so-called counterfactual distribution, which is a mixture of a conditional distribution of the dependent variable (income) and a distribution of the explanatory variables (individual people’s characteristics). Then, we utilized the residual imputation approach (JMP-approach). Findings & Value added: In the article data from EU-SILC (Statistics on Income and Living Conditions) were used. We found that there exists an important diversity in the size of the gender pay gap across members of the European Union. The results obtained for these countries allowed us to group them into clusters. In general, there are two types of countries in Europe: the countries, where the bulk of the observed income differences cannot be explained by observed characteristics, and the countries, where the explained and the unexplained effects are both positive, with even a bigger explained effect for the lower income ranges. Arulampalam, W., Booth, A. L., & Bryan, M. L. (2006). Is there a glass ceiling over Europe? Exploring the gender pay gap across the wage distribution. Industrial and Labor Relations Review, 62(2). doi: 10.1177/001979390706000201. Blinder, A. (1973). Wage discrimination: reduced form and structural estimates. Journal of Human Resources, 8. doi: 10.2307/144855. Boll, Ch., & Lagemann, A. (2018). Gender pay gap in EU countries based on SES (2014). European Commission. doi: 10.2838/978935. Chatterji, M., Mumford, K., & Smith, P. N. (2011). The public-private sector gender wage differential in Britain: evidence from matched employee-workplace data. Applied Economics, 43(26). doi: 10.1080/00036841003724452. Christofides, L., Polycarpou, A., & Vrachimis, K. (2013). Gender wage gaps, ‘sticky floors’ and ‘glass ceilings’ in Europe. 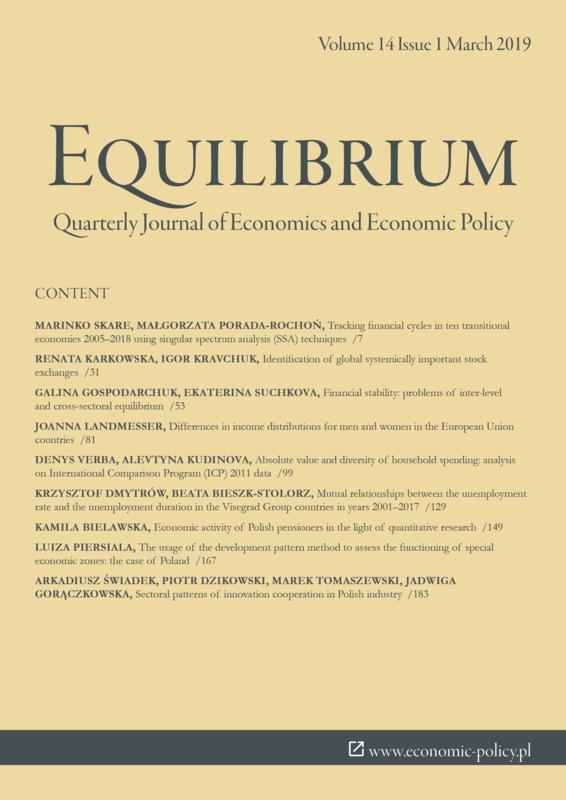 Labour Economics, 21. doi: 10.1016/j.labeco.2013.01.003. DiNardo, J., Fortin, N. M., & Lemieux, T. (1996). Labor market institutions and the distribution of wages, 1973–1992: a semiparametric approach. Econometrica, 64. doi: 10.2307/2171954. Donald, S. G., Green, D. A., & Paarsch, H. J. (2000). Differences in wage distributions between Canada and the United States: an application of a flexible estimator of distribution functions in the presence of covariates. Review of Economic Studies, 67. doi: 10.1111/1467-937X.00147. Eurostat (2018). The unadjusted gender pay gap, 2016. Retrieved from https://ec.europa.eu/eurostat/statistics-explained/index.php/Gender_pay_gap_st atistics (10.01.2019). Fortin, N., Lemieux, T., & Firpo, S. (2010). Decomposition methods in economics. NBER Working Paper, 16045. doi: 10.3386/w16045. Hedija, V. (2017). Sector-specific gender pay gap: evidence from the European Union countries. Economic Research-Ekonomska Istraživanja, 30(1). doi: 10.1080/1331677X.2017.1392886. Juhn, Ch., Murphy, K. M., & Pierce, B. (1993). Wage inequality and the rise in returns to skill. Journal of Political Economy, 101. doi: 10.1086/261881. Jurajda, Š. (2003). Gender wage gap and segregation in enterprises and the public sector in late transition countries. Journal of Comparative Economics, 31(2). doi: 10.1016/S0147-5967(03)00040-4. Landmesser, J. M., Karpio, K., & Łukasiewicz, P. (2015). Decomposition of differences between personal incomes distributions in Poland. Quantitative Methods in Economics, 16(2). Landmesser, J. (2016). Decomposition of differences in income distributions using quantile regression. Statistics in Transition - new series, 17(2). doi: 10.21307/stattrans-2016-023. Machado, J. F., & Mata, J. (2005). Counterfactual decomposition of changes in wage distributions using quantile regression. Journal of Applied Econometrics, 20. doi: 10.1002/jae.788. Nicodemo, C. (2009). Gender pay gap and quantile regression in European families. IZA Discussion Paper, 3978. Oaxaca, R. (1973). Male-female wage differentials in urban labor markets. International Economic Review, 14. doi: 10.2307/2525981. Oczki, J. (2016). Gender pay gap in Poland. Ekonomia międzynarodowa, 14. doi: 10.18778/2082-4440.14.03. Pena-Boquete, Y., De Stefanis, S., & Fernandez-Grela, M. (2010). The distribution of gender wage discrimination in Italy and Spain: a comparison using the ECHP. International Journal of Manpower, 31(2). doi: 10.1108/0143772101 1042232. Śliwicki, D., & Ryczkowski, M. (2014). Gender pay gap in the micro level – case of Poland. Quantitative Methods in Economics, 15(1).